NEW YORK -- Court records reveal a timeline of events in the vicious murder and attempted burial of a Connecticut man who went to a party in New York City last weekend. BRIEF SUMMARY: Joseph "Joey" Comunale, 26, traveled from Stamford to Manhattan on Saturday, Nov. 12, and went out to a nightclub in Chelsea. He later ended up at a party at an apartment in the Upper East Side, and that was the last place he was seen alive. Comunale's father reported him missing Monday. 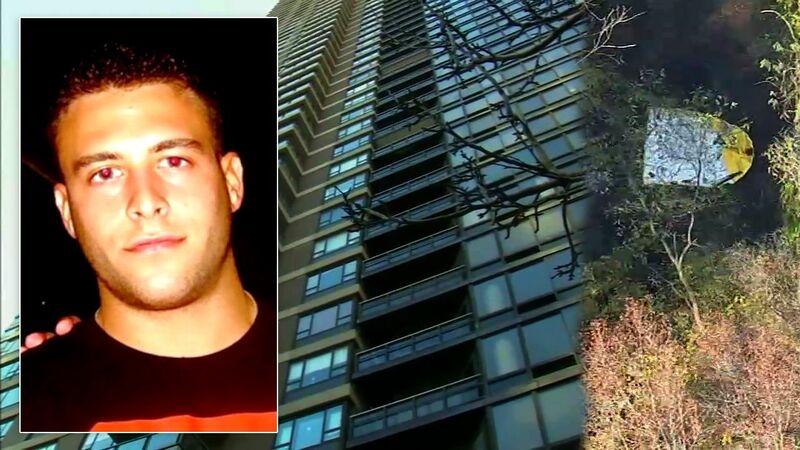 When the NYPD went to the apartment where he was last seen, detectives found evidence of foul play and interviewed the person who lived there -- 25-year-old James Rackover (more about his arrest record here). The investigation led the NYPD to Comunale's burned and shallowly-buried body in Oceanport, New Jersey, on Wedesday, and then to the arrests of Rackover and 28-year-old Lawrence Dilione. Police said Comunale was stabbed 15 times, and it appears to have come after an apparent argument. The criminal complaint filed Friday fills in some gaps of what allegedly happened in-between. Check out the timeline below. Joey Comunale travels from Stamford to New York City. He goes out to the Gilded Lily nightclub in Chelsea with at least one friend, investigators said. Comunale tells his friend that he's going to attend a party at 418 East 59th Street, which is located between First Avenue and Sutton Place near the Ed Koch Queensboro Bridge. Surveillance video shows Comunale entering the building with others, the criminal complaint states. The video later shows Comunale leaving the building with Dilone and three women. A short time later, at about 6:50 a.m., Comunale is seen re-entering the building with Dilione. "Mr. Comunale is next seen in an elevator with defendant Dilione and then is not seen again on video within or leaving the building," the complaint states. James Rackover is seen leaving his apartment building on East 59th Street and placing a large duffel bag into the trunk of a black vehicle with tinted windows that was parked outside the building. Police later identified the car as being a 2015 Mercedes Benz that's registered to Jeffrey Rackover - a friend of James who has became a father-figure to him and tried to help get him back on track in NYC after some criminal activity in Florida. Jeffrey lives in a different apartment in the same building. License plate readers indicate that the Mercedes traveled from the Upper East Side of Manhattan onto the FDR and through the Holland Tunnel to New Jersey. A little more than five hours later, a vehicle with the same license plate as the Mercedes is recorded coming back through the Holland Tunnel. It heads north on FDR Drive. Surveillance video from a parking garage on East 58th Street in Manhattan shows where the Mercedes went next. "I observed what appeared to be a black Mercedes, driven by defendant Rackover, enter the garage and park, after which I observed defendant Rackover leave the vehicle," the NYPD detective wrote in the complaint. Comunale's father reports his son missing, after not hearing from him. Police issue an alert for the missing man. A detective goes to the fourth-floor apartment where Comunale was last seen Sunday morning, and talks with James Rackover. According to the complaint, Rackover tells the detective that he hosted a party in his apartment in which his friend, Larry Dilione, a number of women and a man he didn't know attended. Rackover says he doesn't know what happened to the young man who attended his party. An NYPD detective talks with Larry Dilione. The criminal complaint states he told the detective, in part and in substance: "I know James. He lives in Apt. ___ of 418 East 59th Street. I went with Joey to a party that James threw in his apartment ___ on November 13, 2016. We took Joey's body to Oceanport, New Jersey and we buried it in a vacant lot." Dilione then shows the detective on a map where he and another person buried the body, the complaint states. Later that day, a cadaver dog approaches Rackover's Mercedes parked in the garage and makes a positive alert for the presence of a human body or bodily fluids in the area of the trunk or rear panels of the car, the complaint states. The K-9 officer takes the cadaver dog to James Rackover's apartment, and the dog also indicates that there was a presence of a human body or bodily fluids at that apartment. Detectives would later find blood splatter inside that apartment. NYPD detectives and Oceanport police officers go to the location given by Dilione, and they find a buried body of a man whose physical description matched that of Joey Comunale's. Near where the body was discovered in a 1-foot-deep grave, investigators found a large duffel bag. The medical examiner determined that the cause of death of the body found was multiple stab wounds to the torso and the manner of death is ruled a homicide. Police arrest Rackover and Dilione in connection with the murder of Joey Comunale. Their bail was each set at $300,000 cash or $3 million bond. The next court date for the two is set for Nov. 21. The motive of the murder remains unclear. Stay with Eyewitness News and abc7NY for the latest on this developing story.